In this post we are going to create an Angular App to use Button toggle groups from Angular material. We are going to do data binding of these buttons and generate the buttons using a list in the code behind in the component class. Let’s first create a simple Angular App using Angular CLI. 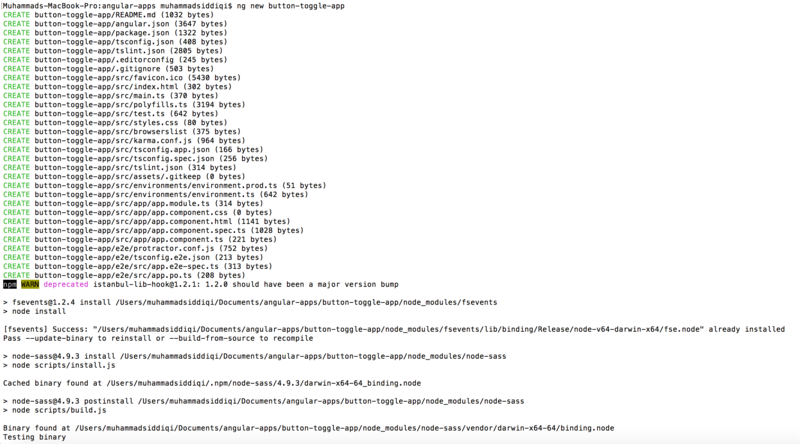 Now let’s install the necessary npm modules to use the toggle buttons. Let’s import the material modules to app module. This allows them to be used in the whole module. Let’s introduce an array in the code behind (app.components.ts). We are going to use this array to create the list of toggle buttons in UI. Here we are using the toggleButtons collection with *ngFor. We are binding the individual item to the value property of the toggle button. Please note that we are allowing multiple values to be selected in the button group. We are then displaying the selected options just below the button toggle group. We can handle toggle events for individual button. We can even pass the selected / unselected value in the button group. It must be remembered that it handles the binding before emitting events so if you want to use the set value of the bound property, it should be alright. Here is how we can update the code behind. 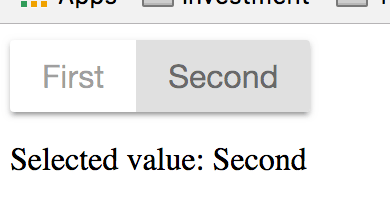 We have just added a method to handle the value change of the buttons. We are just printing the current value and all the values currently selected by the button group. Now we just need to use it in the template. Now you would see the error when you create a SourceRecord with a value missing the non-optional fields.